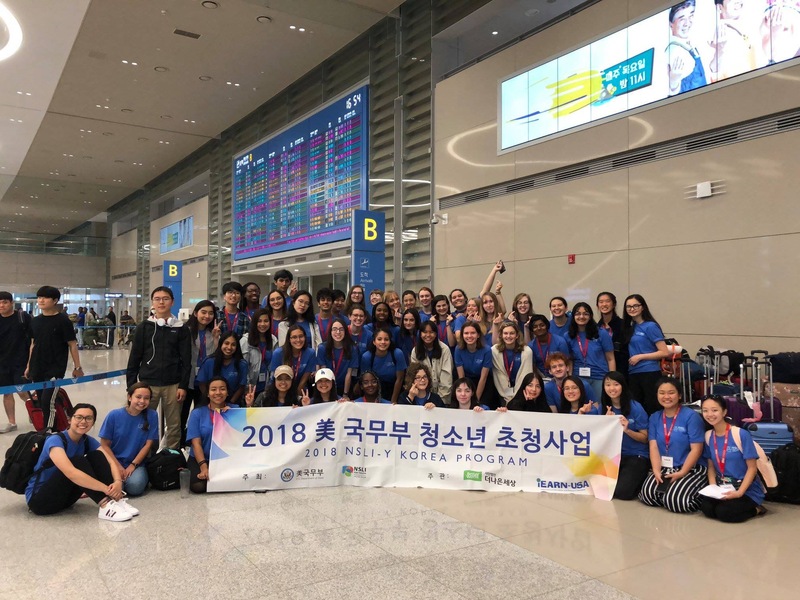 Shreya is from Plano, TX and participated in the 2018 Korean summer program. I wanted to share a translation and video of the Korean speech I wrote for my program’s closing ceremony. While writing it, I reflected on the growth we’d all experienced over the six weeks and thanked the people who made it possible. The content of this speech sounds rather simplistic in English, but a lot of thought was put into each sentence! Hello! My name is Shreya, I’m sixteen years old (in Korean age), and I’ve come from America. Today, I’ll be talking about what I’ve experienced in the last six weeks through the NSLI-Y program. When I first came to Korea, I was as anxious as I was excited. I was worried that I might not be able to have conversations with Korean people at all, and I tend to get lost easily, so I was very nervous about that as well. However, each day was so busy that there was no time to worry. After attending Korean class for four hours, we went to supporter meetings or cultural clubs and learned more. We had so much to do, but, perhaps because we learned in such a fun manner, it always felt like play. I think we’ve all grown so much more than we expected. Through the NSLI-Y program, I was able to meet friends of diverse backgrounds who have an interest in foreign languages and other cultures. While studying hard and playing hard together, we were able to learn new things. We’ve become so close, and it’s such a shame that we must part so quickly. When I see my friends, I am proud. 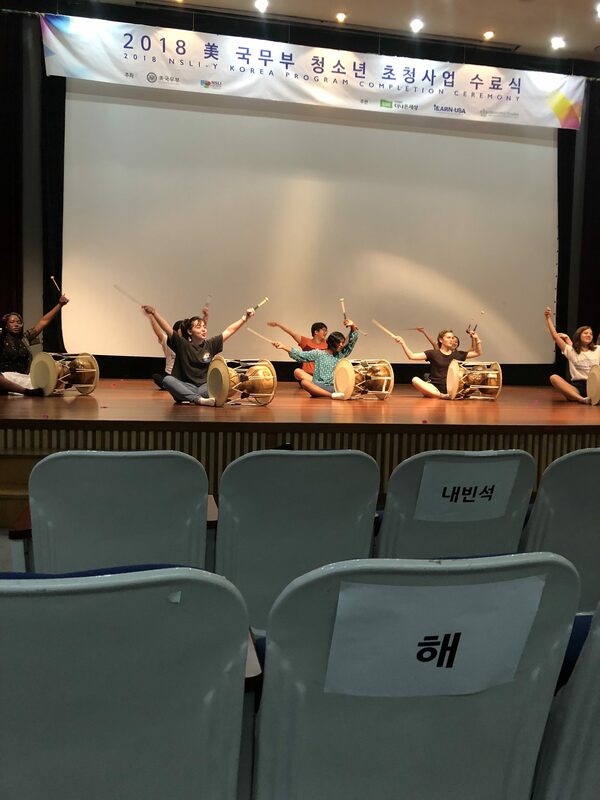 Through their persistent efforts, not only has their Korean ability proved, but they’ve also become able to understand Korean culture better. I’d like to thank you all for giving us this special opportunity. First off, our teachers are the best. They teach us in a fun way and never get angry no matter how many questions we ask. Even when we joke around by greeting them, “안녕하시옵니까?” (an ancient and hyper-respectful way of saying hello, used when speaking to royalty) and answer them, “알겠사옵나이다” (with the same level of formality, saying that you’ve understood something ), they never get annoyed. Thanks to our teachers, I’m able to use a wider variety of vocabulary and grammar in this speech. Ms. Choi Yu-mi and Ms. Choi Hyeong-Yeon, 사랑하옵나이다 (another ancient expression that means ‘I love you’). Also, thank you to our cultural club teachers for giving us the opportunity to learn traditional Korean culture. I also want to mention our supporters. Our supporters are all so kind, and they always strike up conversations with us so as to avoid any awkwardness. Outside the classroom, they helped us with speaking practice, and we were able to spend an enjoyable time through going on cultural excursions together. And thank you so much to the Better World staff, Minjeong, Alicia (The last two people were our wonderful Residence Directors). It was due to your constant support that this program was able to operate with no problems. Lastly, I’d like to thank the host families. I think you’re all amazing. You opened your hearts to us and treated us like family. I didn’t expect to become so close with my host family, but now that I must leave, I’m so sad. We had always had fun conversations while I did my homework, and it was so funny and whenever we practiced English pronunciation together. Later when I come back to Korea, I most definitely want to meet again. As someone who had only ever studied Korean at home before coming to Korea, I can’t explain with words how happy I am to have been able to be a part of the NSLI-Y program. Thank you once again. Everyone, have a nice day!